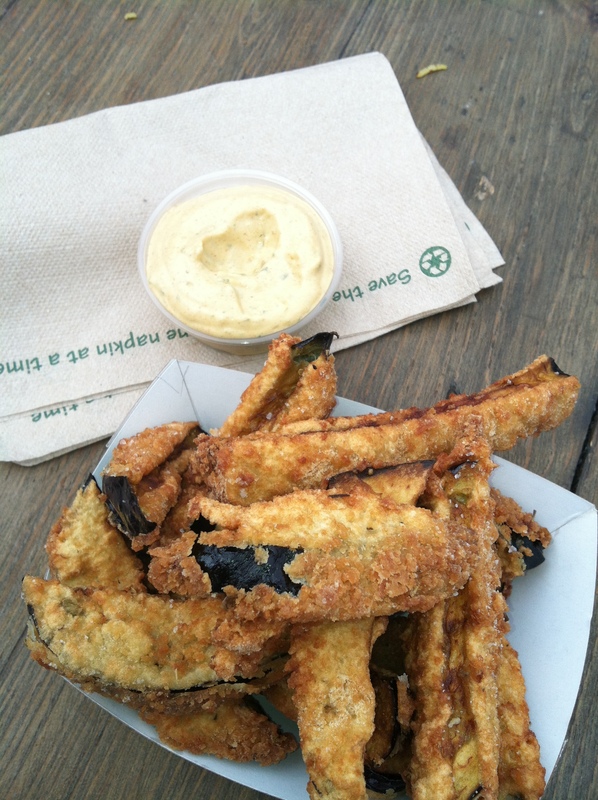 After performing 4 shows with the amazing Al-Bahira Middle Eastern Dance Theater in the International Bazaar at the state fair, I was ready to eat, and so was the rest of the troupe!We started the afternoon with some eggplant fries from Sonora Grill at the Midtown Global Market. They were utter perfection. Crispy on the outside, soft on the inside, and not rubbery at all, which can be one of the challenges of cooking eggplant. And whatever the heck that dipping sauce was…we were on board. Then we went on a dairy kick, sampling the frozen custard from Custard’s Last Stand (not pictured because we ate it too quickly) and that passed the dancer test with flying colors. If you haven’t tried that, put it at the top of your list for next year. 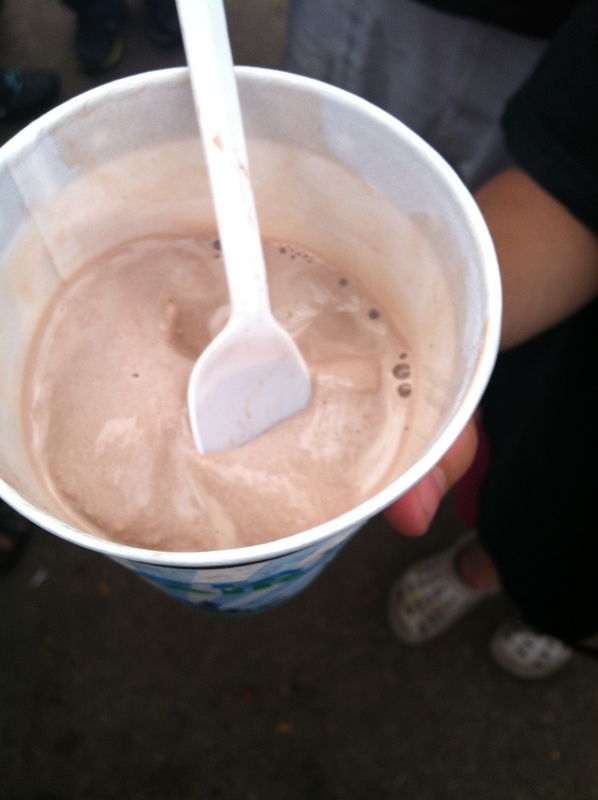 We also gobbled up a strawberry, chocolate, and apple malts from the dairy building. All, also, delicious. While we sampled our malts, we waited in line for deep fried pie from Minneapple. You’ve heard me talk about these pies before, but I now have a pack of people who can vouch for how amazing both the apple and the pumpkin pies from this stand are. 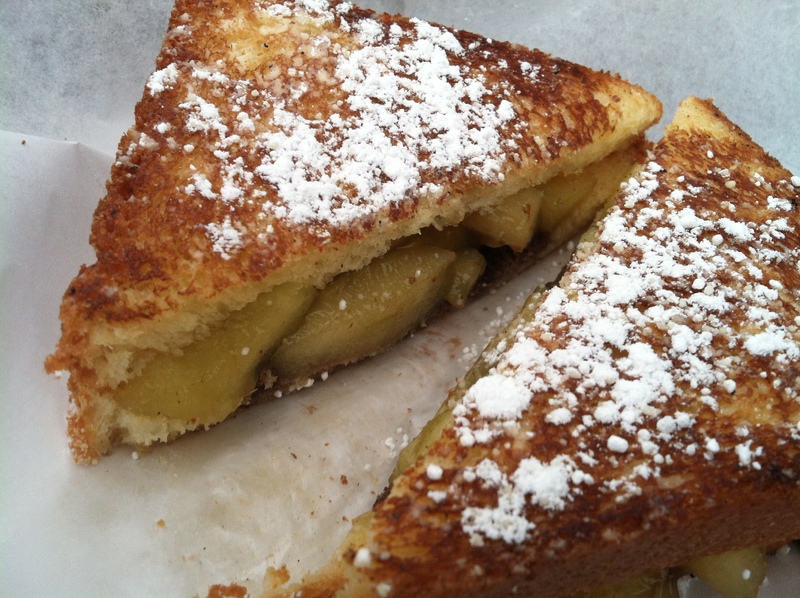 After that, we hit a rocky patch with the grilled yankee apple and chocolate pie sandwich from Moe and Joe’s Coffee. Apples and chocolate grilled between two buttery pieces of brioche sounds like a great idea in theory, but in practice it fell flat. It was fine, but not spectacular. Next up, we wanted a little “real” food, so we stopped by Juanita’s Fajitas. Depending on what fajita you tried, there were various reviews – not enough steak in the steak fajita, but the chicken had plenty. The flavor was good all around. I apologize for the following string of snacks without pictures, but we parted ways briefly to pick up a bucket of Sweet Martha’s cookies (mixed reviews – not what they’re cracked up to be vs. HOT COOKIE IN MY MOUTH YUM) along with the all you can drink milk (definitely the best milk at the fair) while the rest of the ladies grabbed some corn from Corn Roast. Delicious corn, I was told, but the real treat was the entertainment. Singing, dancing, cheering corn roasters made it quite the experience. We were entertained post-talent show by a dance off between teams of corn roasters. Definitely a fun place to stop. 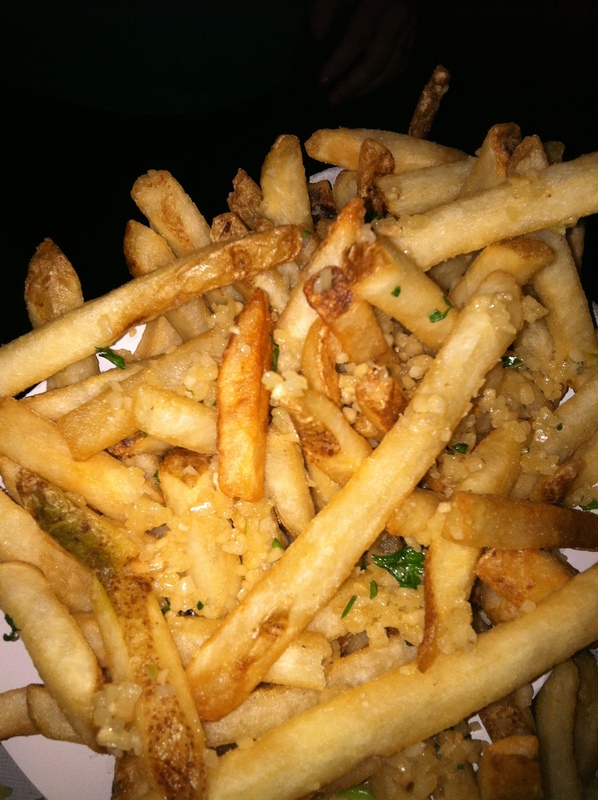 We ended the night on a high note with some garlic fries from the Ball Park Cafe. We couldn’t figure out what they did to that garlic, it was raw, and it was fried, but we knew we wanted it all over our fries. Forever. It will give you terrible garlic breath, but they are super delicious and super worth it. And as a bonus, here’s the Gizmo from Carl’s Gizmo Sandwich. I was first turned on to this big meaty meal by Andrew Zimmern’s review of the fair foods. 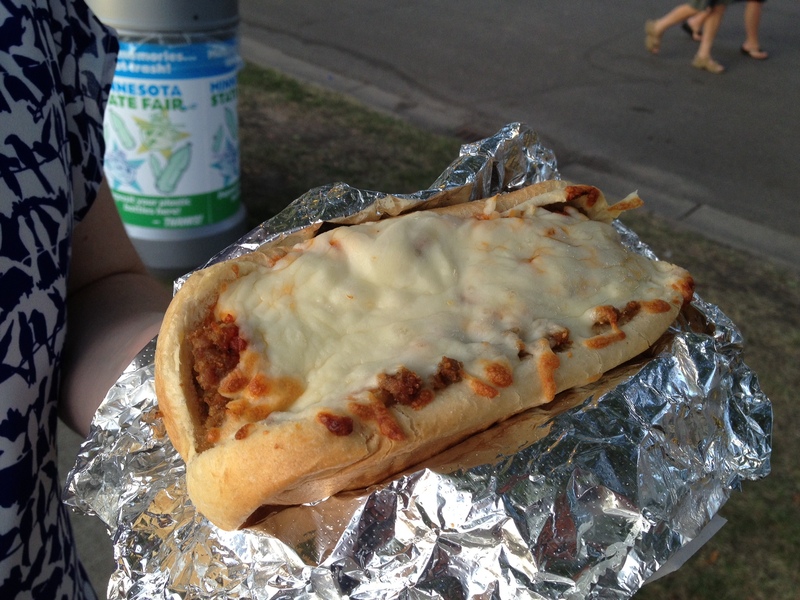 He said that if he could only have one thing at the fair, it would be this sandwich, so of course I had to try it! The meat had great flavor, and while it could have used a little more red sauce in my opinion, when covered in melted mozzarella and wrapped in a hoagie bun it’s pretty darn amazing. But be warned – eat this and you probably won’t have room for much else. That’s it for my fair reviews this year! What was the best thing you ate at the fair? What would you like to see reviewed on this blog next year? Leave me a comment! This entry was posted in Uncategorized and tagged Al-bahira, Ball Park Cafe, dairy building malts, eggplant fries, food on a stick, food reviews, foods at the fair, garlic fries, Gizmo sandwich, Minnesota State Fair, moe and joe's coffee, Sonora Grill, Yankee apple pie sandwich by theculinarycapers. Bookmark the permalink. 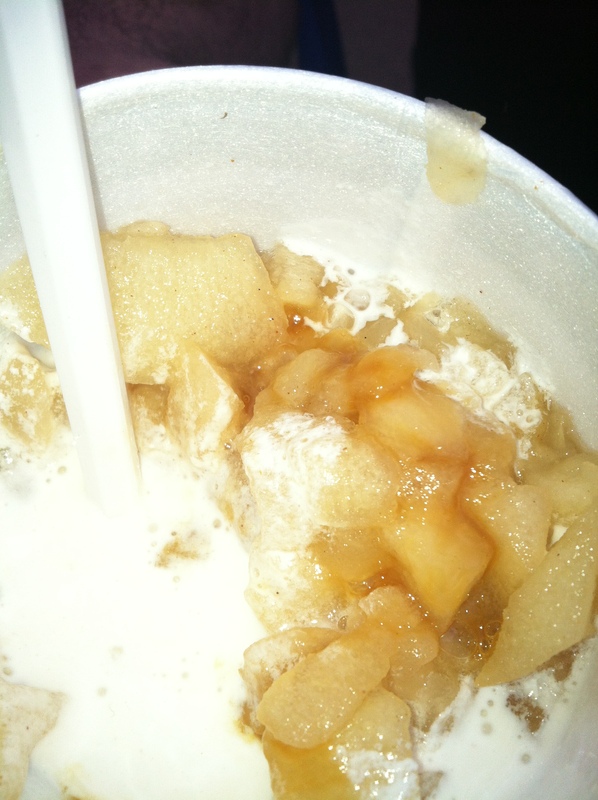 It was seriously one of my favorite things at the fair. Definitely on my repeat list for next year!